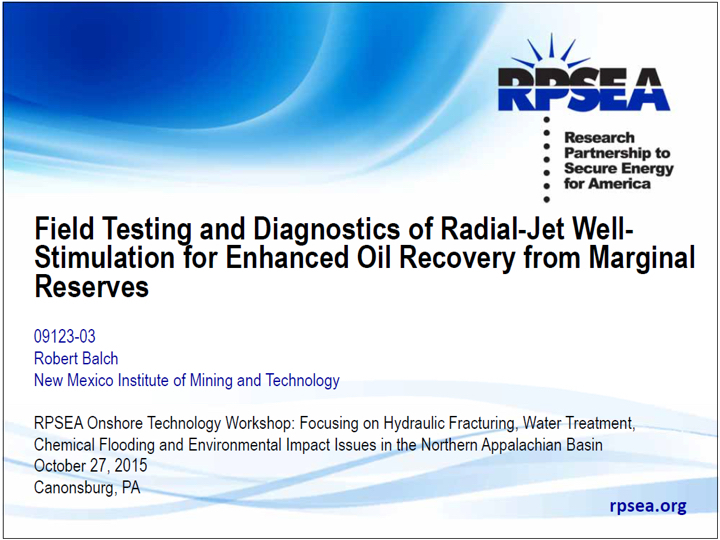 A Branch of the U.S. Department of Energy (DOE), the Research Project to Secure Energy for America or RPSEA, for short, was chartered by the U.S. congress in 2005 with the mission of helping develop and identify advanced ways to recover and utilize domestic (U.S.) energy supplies. 4) develop a survey tool to verify/track the radials. 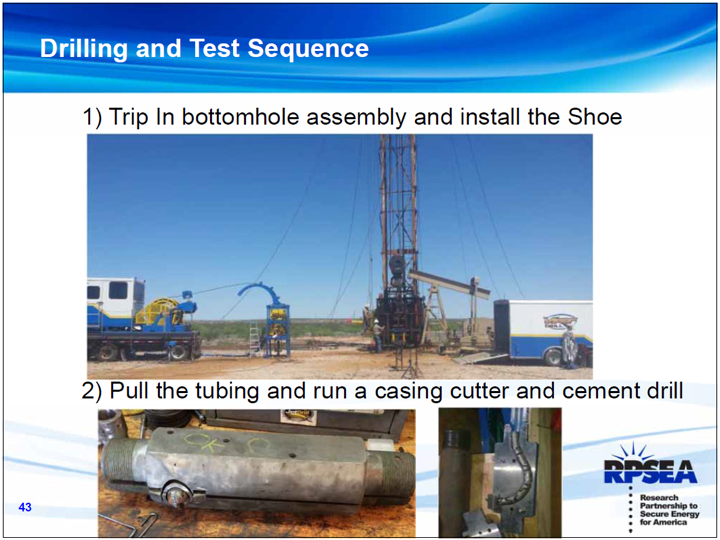 The slides, above, summarize this RPSEA project with Viper Drill and highlights the key aspects of the project. Click here for a full copy of this report. 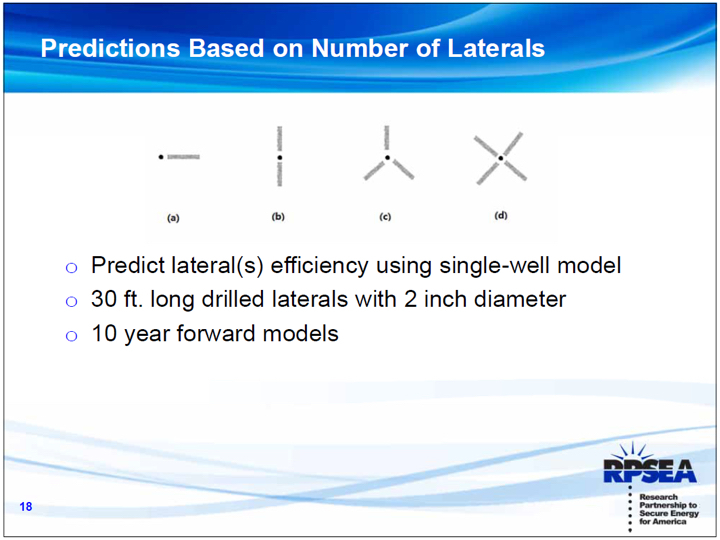 Project Findings: Project Findings The RPSEA project created a flow model to predict the incremental ultimate recovery (over 40 years) from emplacing 1, 2, 3 and 4 thirty (30) foot long laterals. 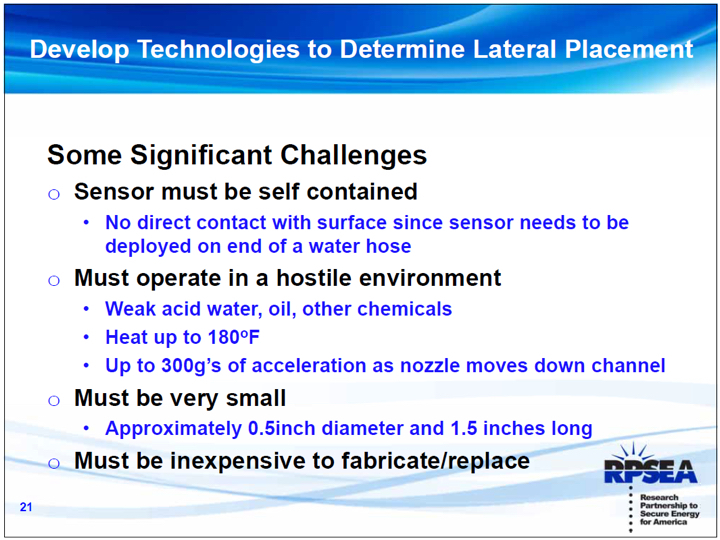 Excerpts of this presentation are shown above. The answer to the question of how many laterals? -- much as what one might expect—boiled down to: 1) the more the laterals, the better; and, 2) it’s a case of diminishing returns, when it comes to the # of laterals. Specifically, the models ranged from an 18% increase in total recovery with 1 lateral… to nearly a 30% increase with 4 laterals (see details, below). 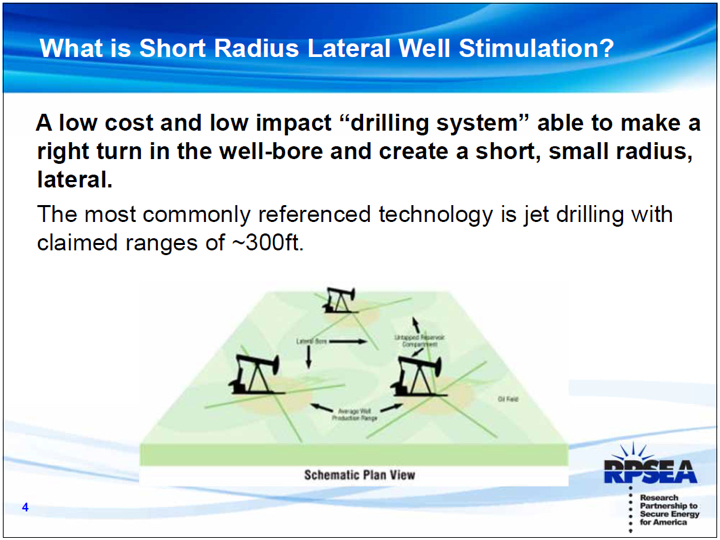 Needless to say, anyone going through the effort to plan and mobilize such services to their wellsite would probably be inclined to place multiple laterals in order to ensure the best chances of realizing the production increases and to account for heterogeneity in the reservoir. 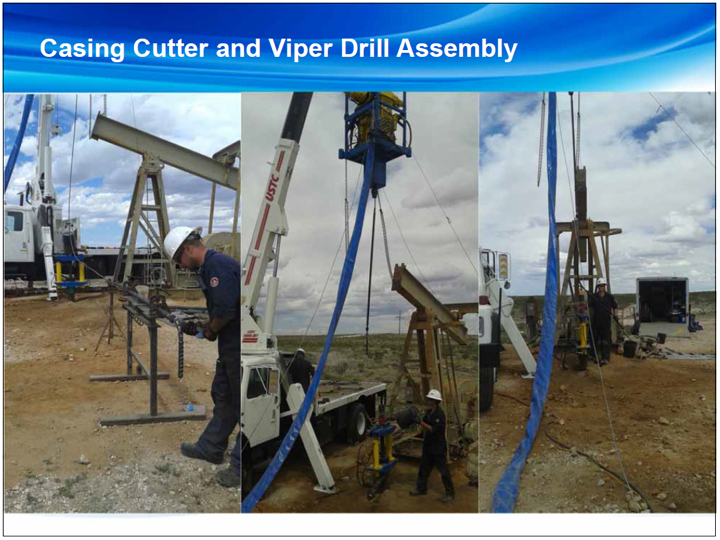 Interestingly, prior to Viper Drill’s participation in this project, RPSEA also modeled the production increase under a scenario where the laterals were 300 feet long (instead of 30). 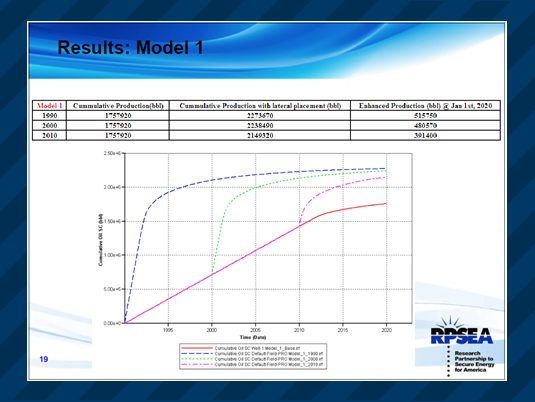 Several flow models (both radial and rectilinear) were run. Click here for a full copy of this report. 30 vs. 300 Feet: Obviously the longer the laterals, the better… but the differences were not as much as one might suspect. The overall conclusion from these reports (as to cumulative production increases), are summarized below. 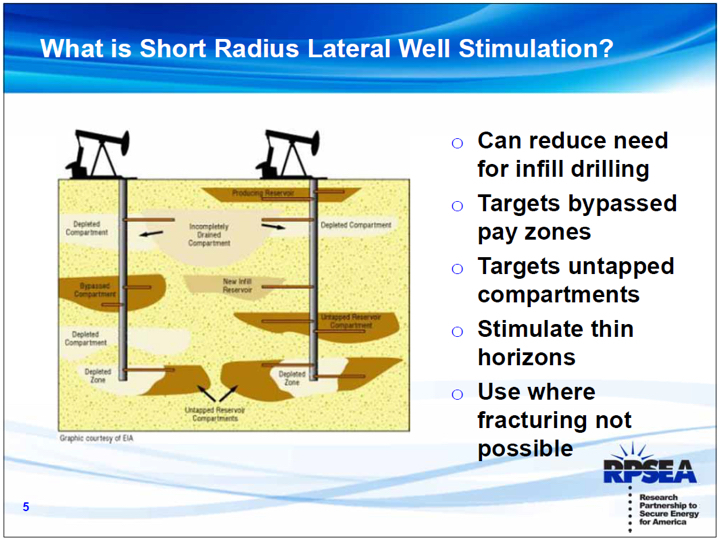 The values reflect the emplacement of 4 laterals and calculate the cumulative production over an assumed 30 & 40 year life of the well, respectively. Acceleration of Recovery: Probably more interesting than the above estimates, however, were the forecasts on the acceleration of the go-forward recovery. 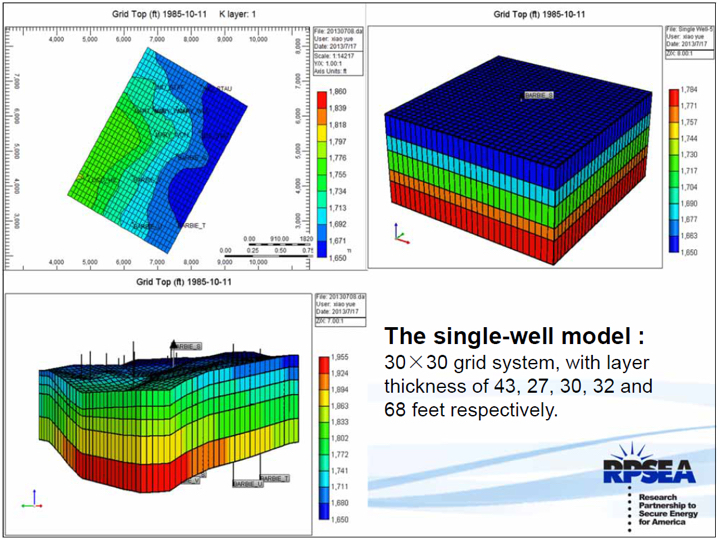 In the chart below RPSEA modeled emplacing laterals at time 0, 10 years and 20 years into the 30 year life of the well. 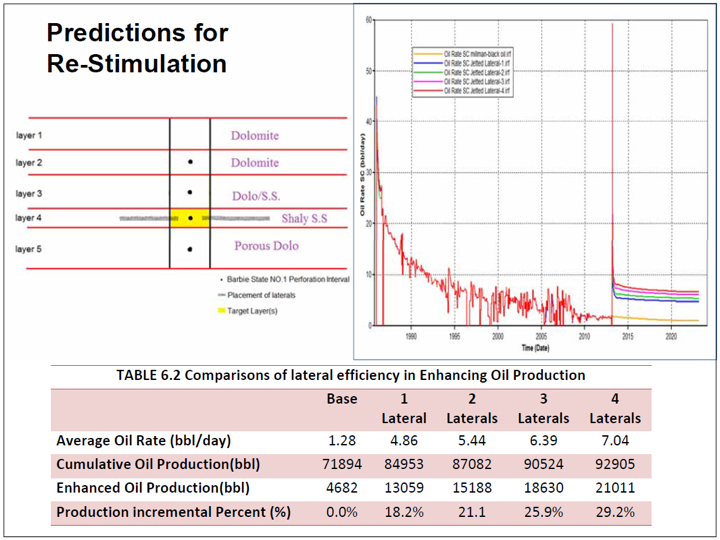 The cumulative production increase for each of the scenarios is roughly the same—about 25-30% over baseline. What is most interesting is the dramatic acceleration of the recovery from the point at which the laterals are emplaced. Note the dramatic acceleration in recovery, when done earlier in the life of the well. Surveying the Laterals: After the Viper team drilled the laterals, the X-Y-Z axis accelerometer probe that RPSEA had engineered were run. 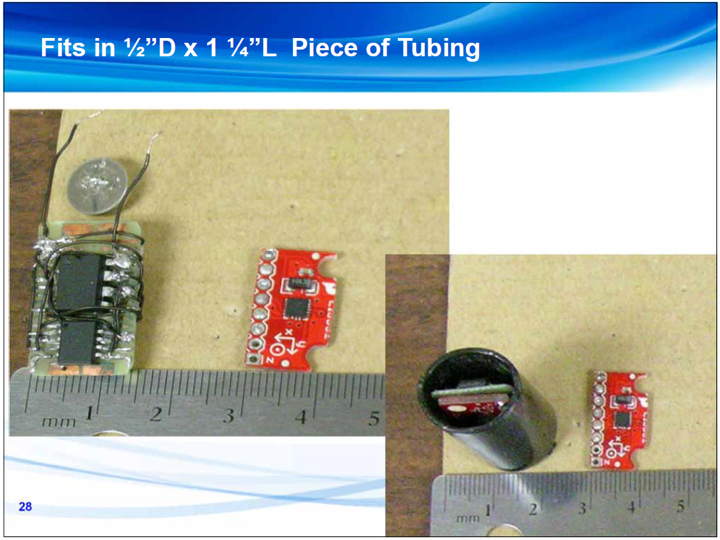 The probe was used to survey the distance and trajectory of the radials— quit a task for a sensor the size of a thimble. 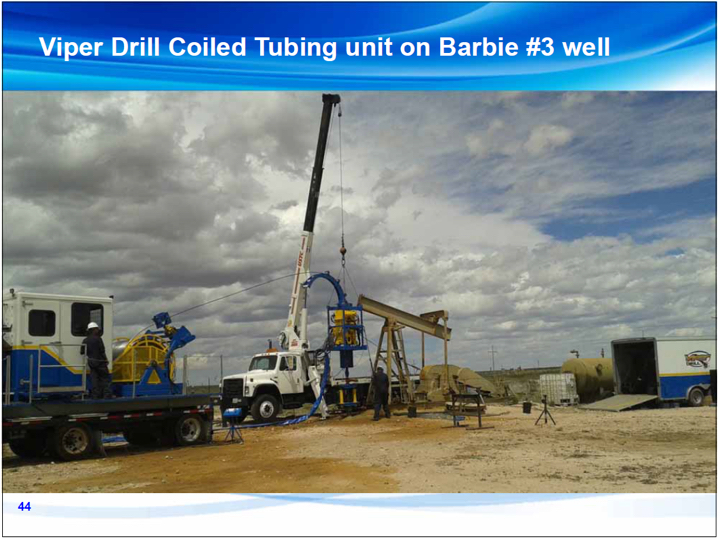 An added difficulty was the fact that more accurate reading are attained the faster one is able to accelerate the probe out of the lateral… a tricky task with an injector head based coiled tubing unit. 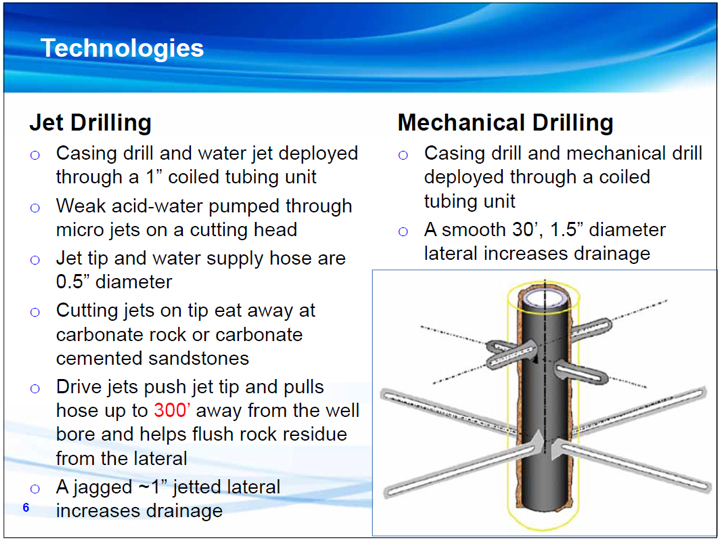 Given the ambiguity of legacy jetting technologies—in terms of whether and where they drilled, this was an important part of the project. 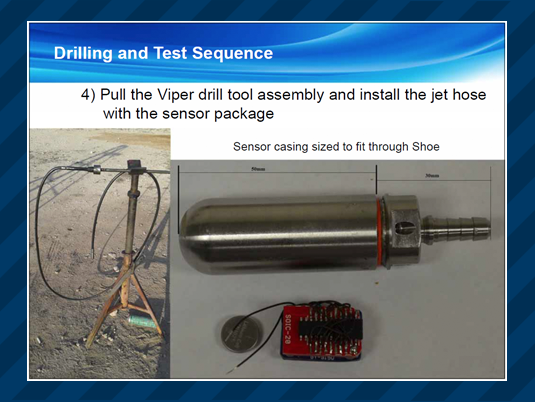 For the project, the Viper Drill team essentially ran 2 style probes—the first, a jetting probe that could not be reliably deployed out the lateral; and, the second, a probe affixed to a modified Viper drillstring. Pictures of these two probes are shown, at right. While the results had some noise in the data (≈10%) as to be expected, the sensor results validated Viper Drill’s surface equipment distance tallies and the ‘telltale’ indicators on the Viper tool-strings (i.e. 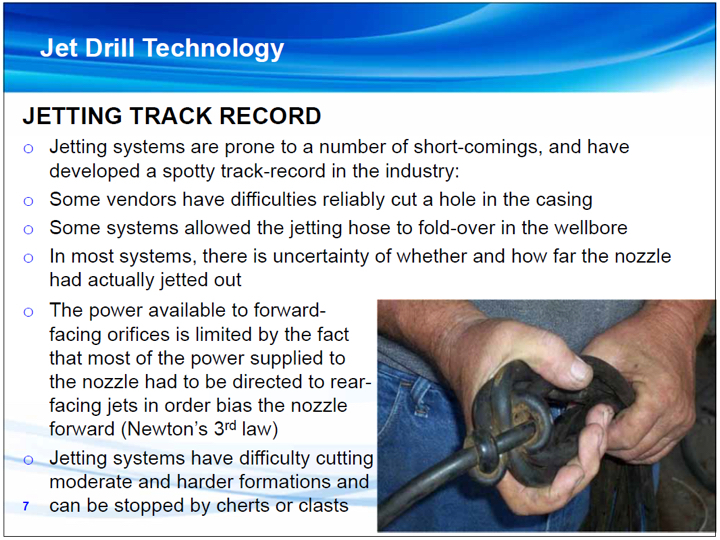 the Viper sting has an indicator which can be seen once the drill string has been retrieved from the well). These RPSEA probe also confirmed the radial trajectories were in a nearly straight line. 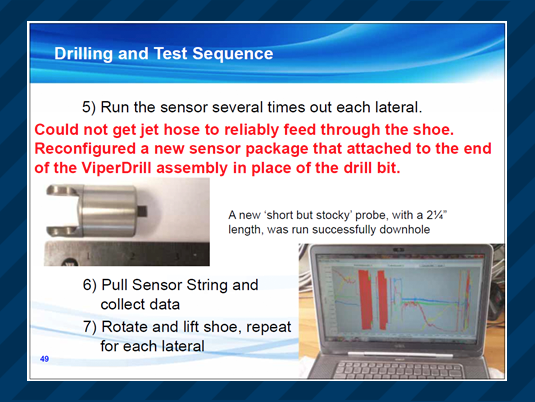 These sensor results aligned with Viper Drill surface tests, which suggested that the drift/drop was within a couple of feet, when the drill-string was a full 30 feet out.